PepsiCo is one the world's largest food and beverage companies, coming in at 46 on the Fortune 500. PepsiCo employs over 220,000 people worldwide across 6 major business sectors. The EHS team were set to roll-out a traditional Behaviour Based Safety (BBS) Program when they paused to ask the question — is there a better way? The trouble was, safety was being commoditised. Everything was about another strategy, another program, another policy — another thing to do. There was a tendency to take a set of objectives and look for the next shiny new program that might lead to an outcome. This approach resulted in small incremental changes, but nothing substantial over time. And so when the Next Big Thing came along, such as BBS… the cycle continued. Leaders were responsible for implementing new programs to drive performance objectives. PepsiCo’s real objective became obvious: find a way to make EHS inherently motivating, and influence employees behaviour at work. The answer lay in bridging the gap between objectives and outcomes. Often, objectives are cooked up in the strategy room — far removed from the real context of work. The reason they fail to connect is simple — narrative and emotion are completely missing from the recipe. By the time any strategy hits the floor, all of the life has been wrung out of it. And all we're left with is another dry, stale, and lifeless set of corporatese. Yawn. The greatest movements all begin with narrative. Narrative fuels emotion, and connects objectives to purpose. And THIS is what leads to real outcomes and change. The result was a communication strategy that aligned with the overall EHS strategy. 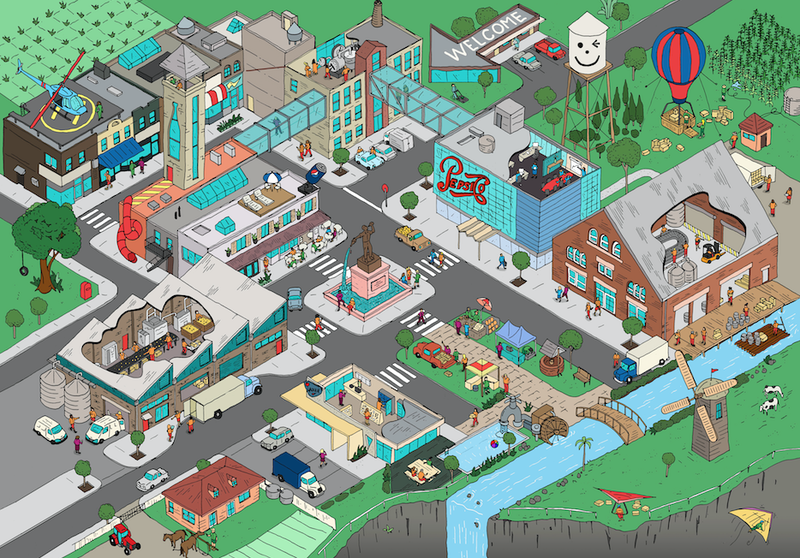 Lead by global, the strategy was delivered to all levels in the organisation through the lens of: what if PepsiCo were of a village of 100 people, rather than 200,000 stretched worldwide. An organisation of 200,000 seems vast and impersonal, and makes it difficult to feel connected to others, some of whom may be thousands of kilometres away. However, a village of 100 encourages a different mindset, and different behaviours. We know and care for everybody in a village of 100. An injury not only effects one person — it effects a family, and the entire village. PepsiCo is one the world's largest food and beverage corporations, coming in at 46 on the Fortune 500. PepsiCo employs over 220,000 people worldwide across 6 major business sectors: Asia, Middle East & North Africa (AMENA), Europe, Sub-Saharan Africa (ESSA), Fritolay North Amercia (FLNA), Latin America (LATAM), North American Beverages (NAB) and PepsiCo Worldwide Flavours (PWF). The PepsiCo Global Environment, Health & Safety Leadership Team (EHSLT) headed up by Megan Tranter (VP of EHS) and Jasmine Omar (Director EHS) are responsible for setting the strategy, ensuring compliance and operational reporting for all these sectors. EHS communication at PepsiCo has been improving over the last 4 years with a focus on increasing engagement by taking a more strategic approach to what information gets passed along — and how that information was presented. A strategic comms session in LA with Jaxzyn, Megan and Jasmine, uncovered the need for a well thought out communication strategy and plan specific for EHS. These words set the foundations for brainstorming what it was that EHS actually stood for -- what the manifesto was, the vision statement, and the tagline. We knew that it wasn’t simply reaching ‘zero’ — zero incidents, zero fatalities, zero impact. This EHS team wanted to contribute more to PepsiCo and the world, by leaving a positive impact. And so a manifesto was born — PepsiCo EHS: Pursue Positive. 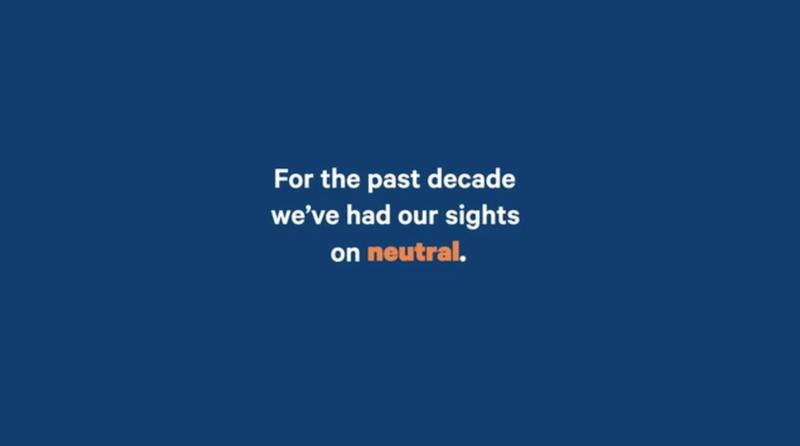 For the past decade we’ve had our sights on neutral. No injuries. No impact. We’ve pursued it with an insatiable hunger — wolves to the scent. No impact — an audacious goal. A worthy goal. But, it’s no longer our goal. It’s a bar still set by industry standards, accepted by our peers. But it’s no longer enough, for us. We are the people who make this company a global leader — not only in food and beverage, but sustainability. 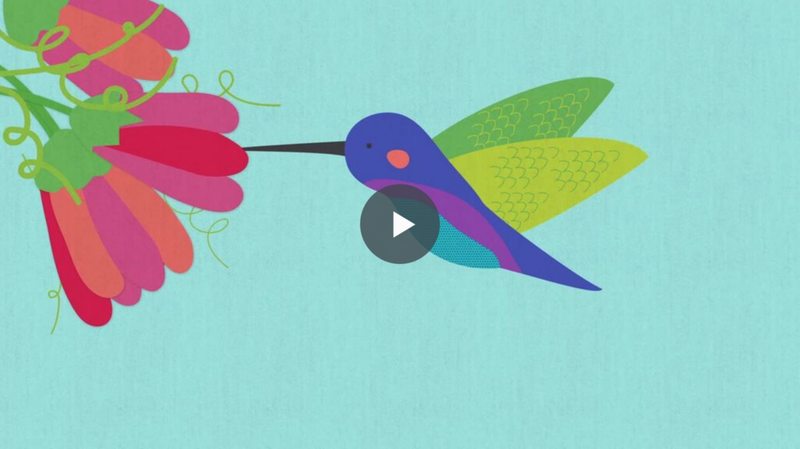 We are the organization that set a vision for a healthier future for people, and our planet. We are the brand that rallied a generation to live life to the max. Neutral is not in our nature. Let’s aspire to more. Let’s push to positive. Where we don’t just get through each day without injury or incident, but leave work healthier and happier. Where we don’t just operate without damaging our planet, but strive to make the world we live in a better place — for the people who work here, our families, our communities, and for future generations. We will do this. Not to follow standards. Not to follow peers. Not to follow — but to change the game. Ergon Energy is an electrical service provider supplying electricity to around 740,000 customers across a vast operating area of regional Queensland. With 4,000 employees Ergon Energy wanted to educate staff, customers and the wider community about electrical safety. In 2014 they launched a behaviour change campaign known as the 'Grim Llama' safety campaign which aimed to prompt folk to ‘Think ahead a bit’ around electricity. The campaign (which is still active today) is about translating strong safety awareness into actual behaviour change. It features the Grim Llama, a memorable trigger designed to bring safety top of mind when people are near potential hazards. Ergon were aware that people had been exposed to the same safety messages for years. In the case of Ergon Energy this resulted in complacency, with folk knowing what to do, but failing to change their behaviour and think ahead in regard to safety and electricity hazards. It can be common issue in the workforce where habituation takes over following identical communication of repeated messaging that no longer register with the end receiver. The Grim Llama campaign challenged the status quo and aimed to break habituation, and revert to a recurrence of the original response. It did this by changing the stimulus with use of communication that cut through the noise and fostered curiosity and even seek to delight. The campaign not only aimed to ensure that people took notice but provided a reminder to people in the moment - all without resorting to fear. Recent research undertaken at Harvard University showed that 47 per cent of a person’s day can be spent lost in thoughts, thinking about something other than what they’re doing. Yep operating on our autopilot. From a Health & Safety perspective this is were we are at our biggest risk if the correct behaviours or processes are not embedded or being practised. But never fear - habituation can be beaten, with better communication accomplished by designing messaging that seizes attention, engages, and seeks to break the cycle to conquer this phenomenon known as habituation. BlueCare is one of Australia's leading in-home, retirement living, and aged care providers. The organisation has over 10,000 employees delivering tailored support and advice to their customers. Aged care can be a difficult industry to work in — physically and emotionally. Cultural surveys undertaken in early 2015 had revealed their workforce was feeling overwhelmed, under pressure, and disconnected from each other and the organisation. Aged care reforms in 2015 pushed the industry into a competitive environment, further increasing the pressure employees were feeling. In 2016, a very serious incident occurred due to a small lapse in concentration from an employee. Initial communications about the incident were delivered quickly internally, but it raised the need for long term culture change to address the root of the issue. To tackle this Blue Care launched a strategy to ensure such incidents were addressed and not to be repeated. It was established that the messaging for the campaign had to be extremely simple, so as to not overwhelm an already overburdened workforce. We needed one simple idea that could infiltrate language, be easy to share, and easy to trigger. Ultimately, it needed to shift mindsets to change behaviours. The idea came from neuroscience, specifically the physiology of what happens to your brain when you pause, take a deep breathe, and then breath out. It’s a process that takes no longer than 3 seconds. Yet the process immediately sends a message to your amygdala that you’re not under threat, cortisol is reduced, we become more present, and capable of making better decisions. The messaging for the campaign became: “3 seconds to pause, and be there – it might feel like a lifetime to you, but it could be a life sentence to someone else”. ‘Take 3’ became a simple mantra that could be incorporated into daily rituals when people found themselves caught up in the ‘busyness’ of the day. To address the geographically diverse frontline workforce, simple packs consisting of a mix of print and digital collaterals to distribute across all available channels at every centre. While the nature of the content was serious, the campaign walked a fine line to bring lightness, optimism, care, and even a little humour, without trivialising the situation. This balance hinged on effective narrative, copywriting and design. The concept of mindfulness hadn’t been explored by BlueCare, and landed well with the audience. The simplicity of the message allowed for easy uptake. This is an excerpt from The Power of Habit: Why We Do What We Do in Life and Business. “I want to talk to you about worker safety,” he said. “Every year, numerous Alcoa workers are injured so badly that they miss a day of work. The people responsible for putting processes into practice must not only have the competence, but the confidence to make the right decisions. To support this, the company has developed a tool called ‘collective insight’, which is used to guide group discussions between management and the workforce on high-risk activities. The aim of these sessions is to review the hazards involved and the associated control measures – and to invite feedback on the planned approach. Where viable improvements are proposed, they are incorporated into the methodology. One idea initiated by the workforce, which has since been adopted, is ‘pit crews’ – committees of employee representatives, voted in by their peers, who meet regularly with management to discuss opportunities for improvement. The initial target is for there to be at least 20 per cent dialogue (as opposed to monologue) in all workforce encounters, but in time this should reach 100 per cent. There is now a strong focus on capturing examples of excellence so that these can be replicated across the organisation. To support this, the concept of a ‘positive investigation’ has been developed. The process applies standard causal analysis (used in the event of an incident) to activities that have been delivered safely. The aim is to identify the primary factors that contributed to its success, while isolating any redundant activities. For example, following the success of a major concrete pour on the Wheatstone LNG project in Western Australia, a positive investigation was conducted and a report produced. This was shared with the client, Chevron, who subsequently circulated it across its global operations. Similarly, individuals can report positive observations through a ‘Good on Ya’ card. This initiative, which was instigated by the workforce, ensures those who go beyond expectations are recognised for their efforts. 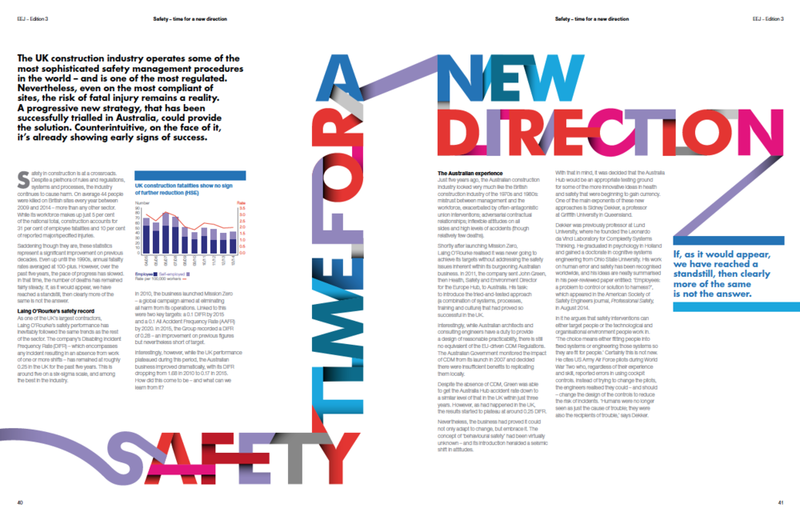 Other safety measures include traditional hard data, such as accident free hours and system health (evaluated in terms of overall performance and responsiveness to change) cultural data, such as frequency of feedback as well as from the workforce and degree of contribution in safety briefings. Safety management should be about protecting people from harm, not protecting companies from litigation. Paperwork and systems are enablers – helping us learn and share lessons. The gap between written guidance and actual work needs to be acknowledged – and workarounds and innovations explored. More than six months into the new strategy, the DFIR in Australia is down to just 0.17, some 35 per cent better than the UK. On sites across the hub, one can see teams routinely coming together before and after the day’s work, planning their approach and (on successful completion) investigating the outcomes. Commenting on its success, Dekker says: ‘It’s apparent that one of the few organisations that have effectively formed a practical view of the new safety paradigm is Laing O’Rourke. They have, in the words of John Green, ‘weaponised’ the theory and developed innovative and exciting tools to move forward’.